It has been quite some time since I have posted an article. The end of the year is a good time to reflect on past prognostications. I do have a list of publicly made prognostications. Of course, my most famous prophecy was the collapse of the oil markets in 1998. I was noted in several publications including front page USA Today. Since then, given my move into the real world from consulting world, my prophecies have been privy to the companies at which I’ve worked. However, you can find some public appearances at conferences where my prognostication skills can be bench marked to reality, I have dug up two from the past – one in 2011 and another while I was running my consultancy in 2015. Both, coincidentally, were at a Platts conference. I seem to do quite well at Platts conferences – perhaps I should be presenting more often there. Last, but not least, the latest news of auto manufacturers layoffs and cutting models made me go back to one of my previous blogs I posted. The last public statement was made at the Platts Refinery Conference back in 2015. Right after that, I was implementing PMA at EDF Trading. At the conference, I was not given much attention as many of my ideas did no support the on-going trend and sentiment. In addition, I hadn’t spent a lot of time back in the refinery industry – but to be honest, its really not as complicated as power – for me it was easy to pick back up where I left. I rebuilt supply/demand models for each commodity. Reviewed and traced each demand and supply sector and examine key inflection points. I also followed up with respective experts/leaders in each product and had wonderful conversations with them. An expert with passion can’t stop talking :)! Please click on this link for the 2015 Platts Refinery Conference Presentation. I started my presentation noting how all the experts in the industry over the past decades have gotten major trends wrong and I wasn’t excluding myself (e.g. lighter crude slate – peak oil etc…). Many in the rooms did not like to hear this. However, if you ever get a consultant/expert to not review and face the facts of the past and admit their errors – run – run as fast as you can. An over confident consultant/expert can cost you a lot more than their fee. I discussed the current landscape with all the new oil and gas production and how ethane will need to find a new home. Currently ethane exports are almost at my 2024 foretasted export level! Also noted was the possible Naphtha issue and the two chemical feedstock would inevitably collide in the market. All of it came true, and the extent was even more than the tempered forecast I presented. I am a realist in the sense there is no reward to forecasting way above consensus – just being away from consensus is enough to get the point. I had an inclination that the situation could be much more dire than I presented, but I was already going against the grain so I tempered the expectations in the presentation. Creating scenarios also allowed the visuals of the direction of the market – note the high case. Going even further back is a presentation I gave at Platts Coal Conference in 2011. I was in a similar situation where I had to relay a bad message to the room – and once again, many did not want to hear it. To view the presentation click on the following link – Platts Coal Refining Conference in March 2011. I noted my calculations of coal retirements made when I was Managing Director Strategic Planning for AEP – which was available in the public documents in one of the AEP Analysts meetings presentation. Essentially I was telling the audience that almost 50% of their demand might go away and that exporting would not solve their financial situations. Of course, no one in the coal conference wanted to heed my warning. The KOL etf had already dropped from highs of 50 in the year to 30’s in October 2011. I heard from some that this David person had no idea what he was talking about – because I was a power guy not a coal guy. Hmmm… when most of your demand is from the power sector shouldn’t that be the person you should be listening to? Anyways, the KOL etf is now 12 and we have seen some major bankruptcies in the industry. Export coal is up in volumes but just not even close to drop of volumes from US coal generation. The surprising reflection to note is how well the rail sector has done – perhaps replacing coal with oil and continued Chinese imports – but at some point that will likely end, too. The latest news of auto manufactures laying off and cutting models made me think of an article I posted back in Feb 2015 which I reviewed the BP Energy Outlook. If only the auto guys took heed to my warnings – “…eventually with the falling prices and the improved efficiency improvement the auto manufacturer can produce an SUV with mass appeal and size that can go 0 to 60 in few seconds yet offer 25-40 mpg. Auto manufacturers who ignore this trend will be left in the dust as was seen last time SUV sales outsold compact vehicles. The move to this larger and faster car will swallow the small vehicles leading to overall growth in oil demand while maintaining the CAFE standards.” US total petroleum demand almost re-hit its monthly peak demand set in August 2005. Overall US petroleum demand has been in an upward projection since bottoming after the financial crisis. There are many out there denying the ability of human beings to predict/understand the future. Books like Undoing Project by Micheal Lewis and the conclusions that Israeli psychologists Daniel Kahneman and Amos Tversky demonstrated that humans have a breakdown in their psyche creating poor decisions and inefficiencies in the market. They did not examined learned/experienced forecasters and also did not reach out to successful prognosticators. Much of their tests involve normal sample people, not experienced and trained-to-forecast individuals. We are also seeing the rise of AI and neural networks to take the human psyche out of the equation for decision making. However, it is the human that can relate to the human that is making decisions, even if the human is using AI. So far, I have yet to see an AI be able to go beyond short term analysis given its learning sample is always based on the past and the multiple forward inputs still require some creativity and art for which only an experienced person can create. I good benchmark for when AI is ready is when AI starts making art work so profound. At that point, I would say human prognosticators could likely be looking for another career, but until then – For my fellow aspiring prognosticators I leave you with these tips in order to be a better forecaster. One. Get a real job in the real industry and eventually in the planning and strategy group. Being a consultant your entire career leaves out the feedback loop of reality and you end up in this strange world of advice giving and not knowing how it really matters to the company and the multiple lives you could impact. This is also a note to companies hiring consultants – get one that has been in the industry in a position of planning/forecasting. They will understand your position best and know the bigger picture of what an outlook/position could mean to you and your company. Two. Have a fundamental foundation – examine as deeply as you can the drivers of supply and demand e.g. what are the economics parameters that drive more supply? When and how much does demand respond to price? What alternatives are there? etc.. The devil is in the details – get your hands dirty and get into the details. This is where IF you have passion, it will shine. IF you want to be the best, this is where sacrifices are made. Work longer – sleep and dream the problems – let nothing get in your way – if you really want to understand the market your forecasting. If you don’t, I promise you someone else will, and you won’t be getting it right consistently. Forget all those that say you must sleep so much and rest so much – I believe, when your in the midst of an issue, you must engross yourself and get your rest and leisure later. Nothing worthwhile that can be claimed as a great achievement comes without sacrifices. My first professional boss at Purvin & Gertz, Ken Miller, taught me about having passion for your work. His life was his work. He would carry the largest suitcase full of reading materials everyday. I have never stopped reading as much as I can because of him. He passed away this year, and may he rest in peace – but, knowing Ken, his rest would be reviewing refinery economics. Everyone should have such a boss with so much passion. There is so much that I owe him for showing me the way. Three. Be humble – know that you don’t know everything nor do you have to. In the mid 2000’s, I knew gas couldn’t just rise to the teens without something in between. Did I know it was shale at the time? No. But, I did know the principle of greed and human ingenuity. My premise to pull the prices down from the every growing forward curve came from the underlying thought of greed and human ingenuity, and I used LNG as my placeholder. In my calculations, at the very most, prices would be around $6-7/mmbtu. In the end, we see the development of shale was the ultimate greed and human ingenuity mechanism pulling gas prices back down even farther than I foresaw at that time. However, my premise was still right. It was not ever growing as the forward curve/market thought, and I didn’t have to know everything to save the company billions of dollars from jumping into more coal assets and not buying distress gas assets that later sold for multiple times on the dollar. It is so important to reach an understanding at some point in your career that no matter how much modeling and research is done, the world will unfold not even close to many experts predictions. With that humbleness you will open your mind and begin to, more accurately, prognosticate. You will realize and be more open to multiple outcome probabilities. Having ranges of outcomes does not make you weak, but makes you cognizant of the multiple dependencies that are out of your control e.g. weather. However, you will still need to have a base forecast to discuss where things are likely headed as long as all the dependencies likely head your direction. Over the years, I have come to the realization that humble, but passionate, consultants are the best consultants, as they have been weathered and understand some of the unpredictable nature of the past and very much willing to put in the effort required to maintain expert status. They are confident enough to change their forecast before it is too late and also be brave enough to forecast against the trend. May you have a prosperous 2019 – and stay thirsty to knowledge! Your most humble, super passionate, and grateful but very lucky prognosticator of the energy market! You have your power marketers and energy management team advising you to sign on the dotted line to lock in your power prices before it is too late. Too late for what? Answer: Too late for them to cash in on you in many cases. They typically look at the price of power through historical lenses not through analytical rigor. Past history is not indicative of future results particularly as the landscape is changing. The power markets are engulfed with low natural gas prices along with advancements in energy efficiency and significant renewable development throughout the country. Coal units are retiring. Almost a third of the coal units 10 years ago are going to be retired. Power prices will change as a result. Analyses without a dispatch model will likely lead to wrong conclusions of the future. One reason they don’t concern themselves with changing landscape is that their power price quote to you is time sensitive. Their quote is time sensitive because they too are “locking” in their power price. Most marketers hold no risk and immediately lock in the cost of power on the futures market. They know the margin they are taking from you and immediately lock it in when you sign the contract. The futures market is a complex mechanism full of various actors participating in a game of creating some certainty where none exist. There are trade-offs constantly being made in this complex game of chance. Your power marketer is just a small cog in this scheme. They are, for the most part, just price takers in the futures market, not in the real power market. The real time power market price development is done through a bidding system through time to incorporate operational constraints. In theory, a dispatch model can be designed to emulate the system to produce the expected price given demand, commodity price, and operational concerns. At All Energy Consulting our platform has proven that theory – see historical calibrations. The future power market is different than the real-time markets. Many are more knowledgeable in stock markets than the futures power market. The stock market and futures power markets are more similar than the real time power market. If there are many buyers in a particular stock, we can see that the price of the stock can go beyond historical or sector weighted metrics (Price to earning, book value, etc..). In the power markets, one could use metrics such as cost of production to marginal unit economics to see power prices are extending beyond reality. A simulation through a dispatch model such as the one used in PMA (AuroraXMP by EPIS) can quantify this. At some point, a stock price can be considered over or under value. We can do the same thing for power in the futures power markets. The futures power price can be influenced beyond the fundamentals, no different than a stock price. If the market observes a significant volume of marketers locking in price because they have “sold” the concept to a large amount of buyers, the future price of power can be over priced relative to the fundamentals and potential risk. There is also irrational exuberance in power such as in stocks. These moments are seen when a particular event happens. For example, both the polar vortex and Hurricane Katrina occurred in the recent past causing a large amount of locking in power months after the fact – even though the facts show the odds of such event are limited. This locking in power then turns into an insurance scheme. As a recent insurance commercial discussed, you don’t want to be holding a policy to protect a Ferrari when all you have is an old clunker. However your marketer and energy management companies typically do not have the necessary tools to be able to quantify the risk nor the incentive to inform you. It takes a decade long experience to operate and manage such power models, as noted in my whitepaper Power Modeling. The PMA platform is built for power trading, but can be simplified to be able to quantify risk and measure the extent of irrational exuberance in the future power markets. It is very easy to make the claim gas prices and weather impact power prices. The real value comes from answering by how much. Every region is different and every month is different. Below are some graphs of this July risk factors across the US. We have simulated each month with multiple layers of simulation to give you a full assessment of your power risk. Overlaying the futures market on top of this analysis can easily lead to optimal hedging strategy that goes beyond flipping a coin. Go beyond the surface and contact us. We are not here to sell you power, but to empower you with knowledge. 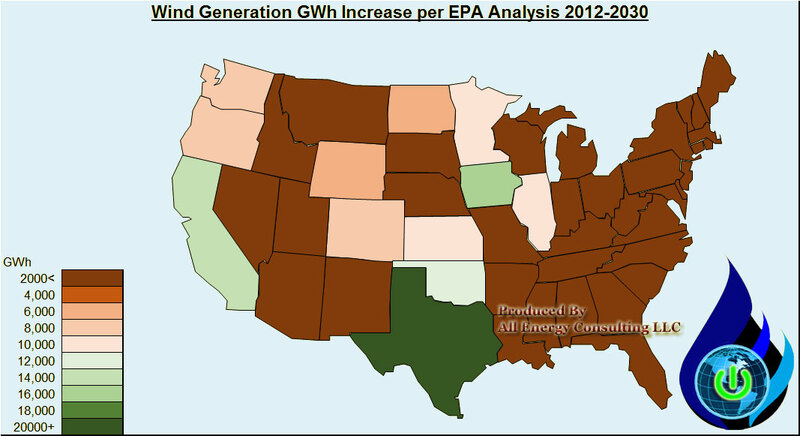 The article I wrote in the October 2014 issue of Public Utilities Fortnightly “EPA Clean Power Plan – An Unequal Burden” (Click for free copy) has been cited in numerous responses by commissions around the country. In this article, I will clarify the intent and introduce another layer of analysis. The analysis was not funded by any entity. The development of the analysis came from pure intellectual curiosity and the enthusiasm of solving a puzzle. All Energy Consulting has not received any payment or business as a result of the analysis done on EPA Clean Power Plan. The article is not intended to argue the merits of global warming. The article is also not intended to absolutely quantify the cost of the plan. The main intention of the report was to demonstrate that the cost of the plan will vary significantly among the states. In order to do this, as noted in the article, we used the implicit EPA calculations for Blocks 3 & 4. In addition, we used our highly sophisticated and very well calibrated power modeling platform – Power Market Analysis (PMA). PMA is used to quantify risk in the futures power markets for hedge funds to end-users. PMA was used to calculate an impact of Block 2. Block 2 per EPA involves the re-dispatching of the system with gas generation over taking coal generation. PMA uses the software AuroraXMP by EPIS which allows us to input our knowledge in a relative easy manner and produce numerous runs in a short time span. We had to produce hourly dispatching results for the entire N. America with at least 15 plus simulations to produce the analysis. 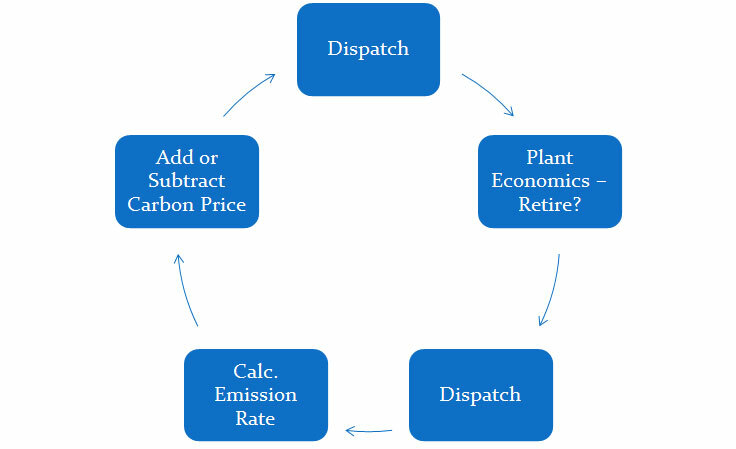 For the analysis, we re-dispatched the system using state by state carbon prices in order to achieve the CO2 emission rates targeted by EPA for Block 2 – see process flow figure below. 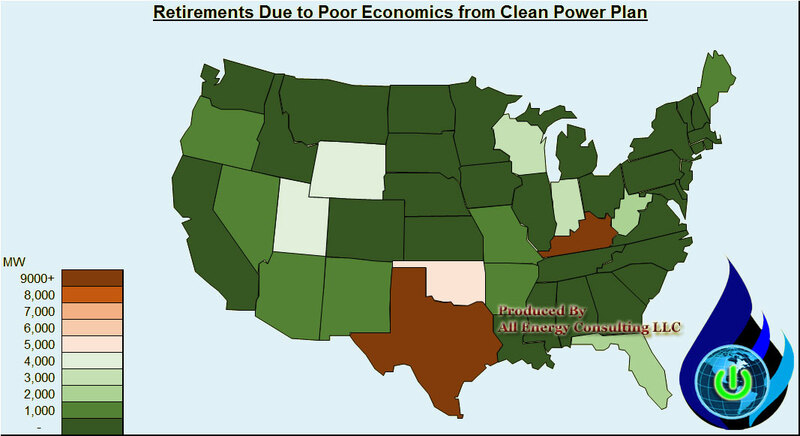 There are limitations with this analysis for use outside the intended use of demonstrating large economic disparity among states as result of the Clean Power Plan. Given our goal of showing large differences in state economic impacts, we did not do a full cost analysis of the plan. EPA simple analysis did not do this either. They just assumed the substitution of generation from coal to gas would be sufficient given the perceived underutilized capacity factors of gas plants. However, a full cost analysis of the plan would involve an iterative approach to retire units no longer economically sustainable. As the CO2 costs rise, many of the existing units no longer produce enough power to be economically supported given their fixed cost of operation. This leads to retirements in the system. 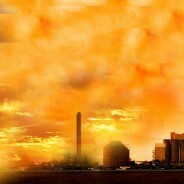 There will be stranded cost issues with early retirements of plants. Our initial analysis did not go that far. The cost derived from CO2 prices to drive those retirements represents a conservative cost that will occur in order to substitute with new technology. In many cases, the cost will even be higher than the CO2 impacts of driving units – mainly coal – out of the system given replacement power needs an economic hurdle to get a project developed. We can certainly do this analysis at All Energy Consulting, but we were limited by time and the need to pay the bills. Given this analysis was done free of charge, and our intellectual goal was to demonstrate large state disparity, we were able to achieve this without a retirement sequence analysis. We were given more time recently and did do the next sequence of the analysis –once again for pure intellectual curiosity – no payment. Taking the output from our 100% Block 3 & 4 case from the article, we did a unit by unit analysis and identified the units that are no longer economically viable vs. the no CO2 case. This amounted to nearly 60 GW of generating units with almost 90% being coal – see map below. This is on top of the already planned retirements. In our base simulation, we have nearly 60 GW of coal plants retired from 2010 to 2016. Gas units are under economic pressure if the plant is located in a state with high carbon prices relative to the surrounding states. There will be gas plant casualties as a result of plant location as electricity flows do not know state boundaries. We then retired those units and re-dispatched the system and went through the process as noted above to converge upon a CO2 rate that would meet EPA rate limits. This took almost 20 simulations given the need to also re-compute the retirement economics as we lowered carbon prices. As expected CO2 prices do fall down relative to the previous results as coal units disappear from the system. Reliability concerns are likely, but can be managed with transmission investments. These costs are not trivial and will show up in retail rates not wholesale prices. Retirements will be balanced by the large expansion of solar, wind, and energy efficiency programs and likely new gas generation from neighboring states. 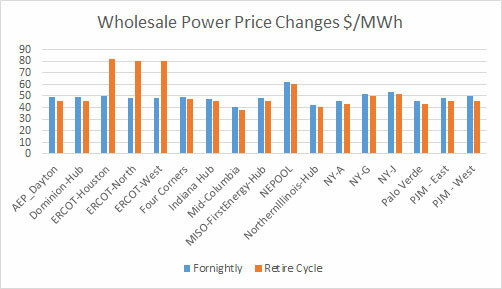 Wholesale power prices in this case are lower than in the previous case given the lower CO2 prices, but for Texas as 24% of the retirements came from there – see below. Texas is expected to get a large dose of wind generation so the wholesale prices are likely to come down and potentially driving even more retirements – see below. Obviously a crucial element was the outlook of the spread between gas and coal prices. Staying with the Fortnightly analysis we used the forward curve projections of 2016 in June 2014. Henry hub averaged $4.26 with CAPP coal prices at $65/ton. Both those benchmarks are much lower now – 25% lower for Henry and 20% for CAPP. Lower spreads likely means more coal retirements. The next step of the analysis is to create a build profile to meet the requirements in Block 3 & 4 and re-disptach it within the system. This will have significant cost plus significant dispatch implications. One of the areas, we are reviewing is the large solar penetration in the west which will likely drive peak power prices negative in the shoulder months. All Energy Consulting can do this analysis, but we are looking for interested parties to fund this stage of the analysis. The result will be a comprehensive cost of the plan. In addition, we will be able to address some of the impacts of such large renewable penetration. Those interested in funding the analysis will get customized views of the results. If you enjoy this type of analysis, please do consider supporting All Energy Consulting by contacting us for your energy consulting needs. We are able to offer these types of analysis because of the support we get from our clients. All Energy Consulting offers a pragmatic but enlightening approach to analyzing the energy markets. Our focus will always be for your success. Background David Bellman was the former Managing Director Strategic Planning at American Electric Power (AEP). He also worked as a consultant in Deloitte Consulting and Purvin & Gertz – now part of IHS. All Energy Consulting was formed in 2011 focused on energy analytics in order to add insights to the energy markets. The American Council for an Energy-Efficient Economy (ACEEE) produces a list of the most energy efficient state each year – link to the report. This report was blasted across the news – Forbes, US News, Bloomberg etc… There was no doubt made by the reporters that the report was empirical and 100% accurate. However, energy efficiency is not an absolute number and requires some thought to produce given the uses of energy and the environment. There are many issues with energy efficiency rankings and how one deciphers the ranking. We will show you a perspective that makes one of the highest ranked energy efficient state in ACEEE rankings to be not that energy efficient after all. The simple definition for energy efficiency is using less energy to provide the same service. In the end, energy efficiency like energy is only a means to an end, not the end in itself. Without a thorough understanding of that fact, this can lead to misleading conclusions. There are many opportunities in energy efficiency analysis that can lead to apples and oranges comparisons causing poor policy choices. Energy efficiency has also been expressed as energy intensity – a measurement with economic parameter typically Gross Domestic Product or Gross Domestic Product per capita. Therefore, the outcome expresses the use of energy and the conversion to the economic parameters – Energy/Dollar. 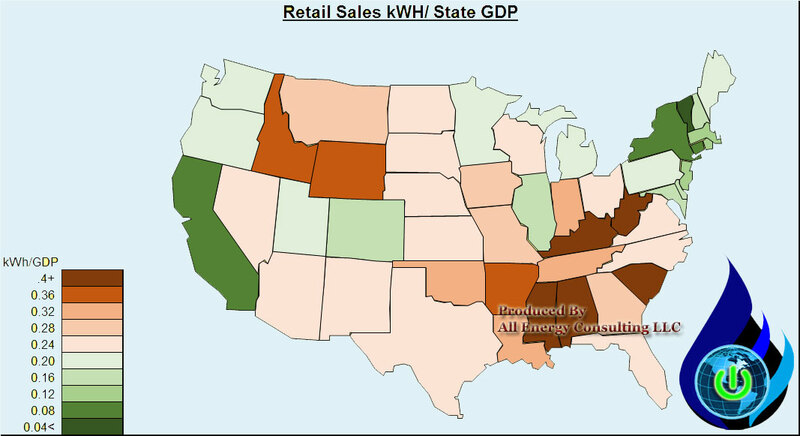 The figure below displays Retail Sales MWH / GDP on a state by state basis. 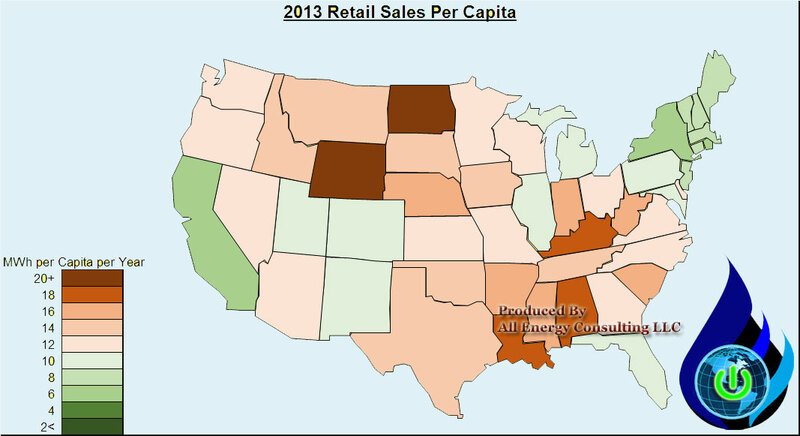 California and the East Coast states look superior to others. If state A economy depends on industrial manufacturing to make the widgets used by state B whose economy involved services such as finance to telecom, the energy intensity calculation would infer that state B is superior to state A. However, this is not the case in reality. Using more energy to generate the equivalent GDP does not mean state A is inefficient. State A should not be made to confirm to state B energy standards for the sole purpose of energy efficiency. 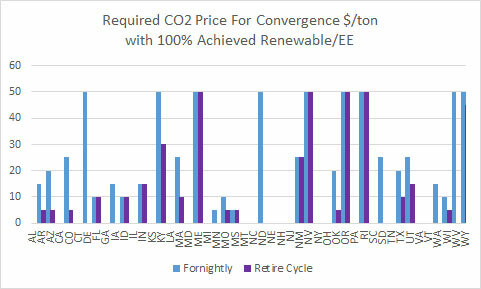 An energy efficiency comparison can be made to state C whose economy is very similar and makes the same amount of widgets. 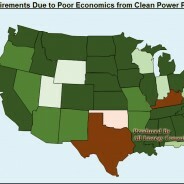 States with different economies cannot be compared in terms of energy efficiency. One could argue the merits of the economy choice (production vs. service economy), but one cannot take the energy efficiency as being comparable given the end product is completely different. The amount of people in a state is also a key point to address. The shear population density changes the use of energy. Those living in close quarters will generally use less energy as the housing is likely smaller and the ambient energy use from your neighbor can reduce your energy use. To take a more dense population region and try to extrapolate the energy efficiency programs and goals to a region not as dense is comparing apples to oranges. By doing, so you are requiring a change beyond energy use if you plan to produce similar results. 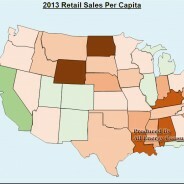 The figure below presents the Retail Sales Per Capita by state. Once again California and the East Coast states look superior to others. However, we know they have a much higher population density per square foot than the rest of the country. 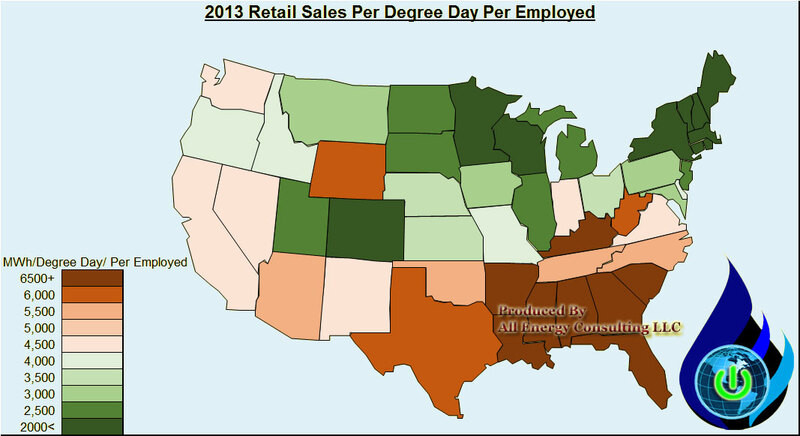 What people are doing in each state is also important in analyzing energy usage as it relates to the economy. If you have a region where significant portion of the population are not employed (a result of unemployed adult and more children in one state than another) their energy usage will be much less than those whose population is working. The employed force potentially creates a more balanced metric of economic parameter than GDP and population given the credit for job creation. In addition, those people are the ones paying for energy whether at home or in the workplace. 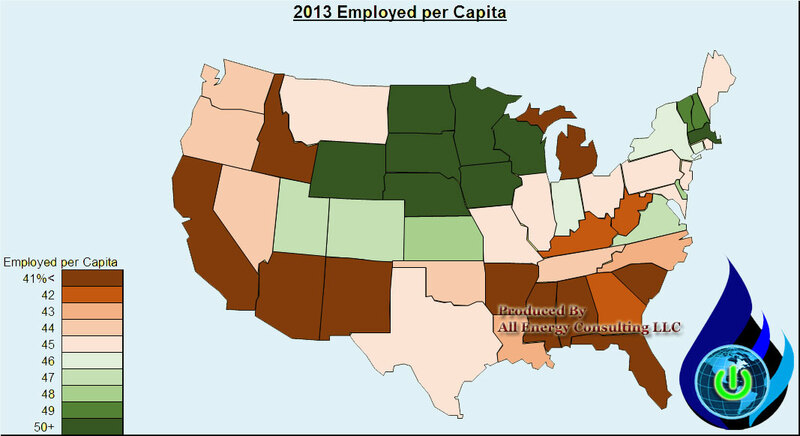 The figure below shows the percentage of employed workforce by state. The surprise is California. California no doubt will be more youthful, but the temperate weather probably leads to heighten level of a casual beach life. There is not much energy usage sleeping on or near the beach. Policy makers would not want to produce policy that lead to great efficiency only to lose jobs. 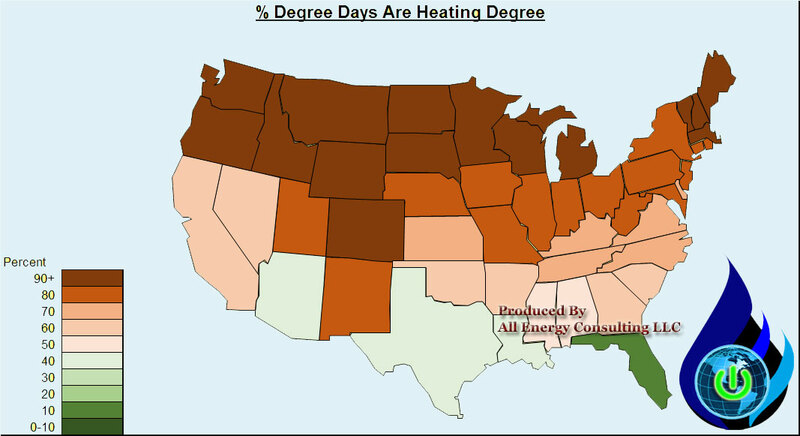 If we view the metric that normalizes weather by dividing energy use by degree day plus incorporate the amount of people employed we can produce a metric less on locational luck and more focused on energy usage and underlying economy – jobs. The figure below does just that. The ACEE report perspective is similar with this perspective for the NE states. Those states, as noted in ACEEE, use their energy well given the weather conditions. However, the number 2 state in their ranking, California, seems to be very lucky given their sunny and temperate disposition based on this perspective. Ohio, in this measure, actually ranks better than California. This perspective still does not account for the less density living found in Ohio relative to California, so in that light, Ohio is doing quite well. Many in the state of Ohio are enamored about all the great efficiency reports being claimed from California. They are desperate to follow California down their path – we just hope they separate the apples and oranges. To even approach some of the metrics presented from California, Ohio will need to change its culture and temperature – both improbable task. 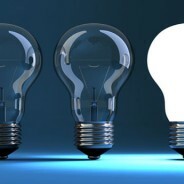 All Energy Consulting is not advocating this is the one correct view – we are being observant and open-minded when it comes to variables such as energy efficiency. There are many lenses to look through to fully appreciate the various energy issues. Coal to Gas Switching – 2012 Déjà vu? This report available in PDF Form. 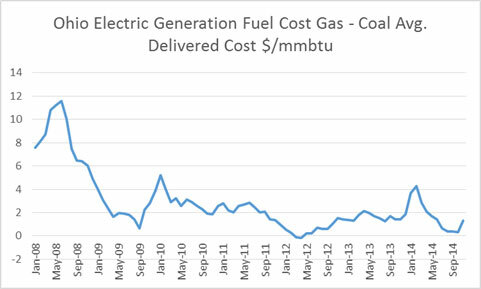 The amount of gas and coal burns in the power markets go beyond simple economics when the price spread between gas and coal are very narrow as observed in 2012 – see figure below. Those attempting to use supply stacks or historical calculations will likely see incorrect numbers. When the price spread is high, those methods will work quite well, as long as the markets do not observe large retirements or new builds in the power fleet. To demonstrate the issue with low gas to coal price spread, we present our calibration results of fuel burns over the last few years. Please note the 2012 discrepancy. One could conclude our models are fatally flawed. However, the goal of PMA is to understand the markets and quantify the risk in the market place. The calibration run represents the default runs that we run forward in time in our BASE case. The key inputs, which drive the BASE case, are weather, economy, and commodity price. Two large areas not demonstrated in the base inputs are outages and utility operations. However, these are simulated in our risk runs that run daily with the BASE runs. The default outage profiles in the BASE case were developed based on a unit by unit investigation over a 5 year period. For the 2014 deviation, much of this can be attributed to outages which are captured in our risk cases. The winter deviation was discussed in our winter assessment. In addition, greater maintenance outage occurred in the shoulder months in 2014 as units have been installing FGD, SCR, and baghouses for the EPA regulations. The relevant issue for 2015 summer is how coal generators plan to operate and dispatch their plant. In the BASE case, utility operations are assumed to be market driven. However, in 2012, this is not what happened for several coal units. To prove this, we re-ran the BASE case with modifying the market behavior of several coal units. Now the figure of coal consumption matches quite well in 2012. The issue in 2012 which resulted in the need to change the operation mode of coal units was a result of the coal purchased in 2011. The futures market curve in 2011 for 2012 showed a much larger spread in gas and coal prices and also a robust power market price. This resulted in a much larger purchase of coal than required in the market place in 2012. This caused coal inventories to be very high- see figure below. This dynamic of coal purchasing was a result in the shift in coal and power markets – see our discussion on Coal Market Changes below. 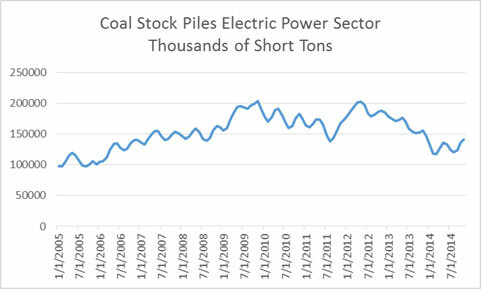 Many plants cited hazardous conditions of stock piles resulting in the need to use the coal regardless of power plant economics. If this behavior did not occur, the trajectory of coal inventories would have gone much higher. The reason not to adopt this method in the BASE case is the issue with power prices and the principle of market behavior being rationale over time. 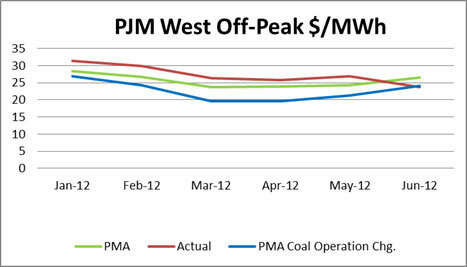 As expected, if the coal generators ran uneconomically, they would distort the price – see figure below. There is a Heisenberg Uncertainty Principle in power modeling. The volumes and price of the market cannot be discovered simultaneously in the same level of precision. As soon as you get your volumes correct your prices will be off. There is a give and take between those two. Given the model was developed for trading power prices and understanding the power market price risk – we prefer to be more accurate on prices than fuel burns. However we can adjust the settings for our clients need. 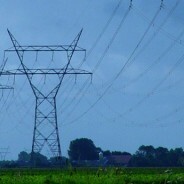 Most utilities still use the futures market as their guideline to purchasing. They should run multiple scenarios and situations using a platform like PMA to really understand the meaning of the futures market. The futures market clearly weighs the risk of near term events more than the actual possibilities. PMA can correctly quantify this risk, so you can make an educated decision on your fuel purchase. Not only can we quantify economy, weather, and commodity price risk, but we can quantify the other facets of the market place such as utility operations presented here. Our 2015 summer assessment (May-Sept) shows if we applied the same utility modifications done in 2012 we can see an increase of coal consumption of 14% from our base case. The likelihood of this is less given the current coal stocks levels are lower plus the change in the market place as several coal units are de-regulated. Before, many of the coal plants could get fuel recovery from their un-economic dispatch – see more explanation below in our discussion Coal Market Changes. This is less likely than in 2012, therefore there is less incentive to run uneconomically. Contact us to get a range of coal and gas consumption in the power sector plus power prices. The current futures market is showing a very tight spread between gas and coal. This may reduce price volatility, but it will make up for it in coal and gas volume volatility. Also, consider creating your own set of conditions and parameters to run through PMA to get a much greater insight in the market space. PMA enables you to use your knowledge applied to our market knowledge. Please consider our services – help us help you succeed. An appreciation of what was occurring in the coal and power market pre 2012 is important to understand the current coal dynamics in the power markets. In the past, coal contracts were developed over long periods of time (some over decades). Overall commodities prices were rising worldwide, including coal. Many coal producers no longer wanted to have long-term contracts in favor of shorter term allowing them to participate in this rising environment. (Oh how they wish they didn’t think that way now – greed gets the best of us.) 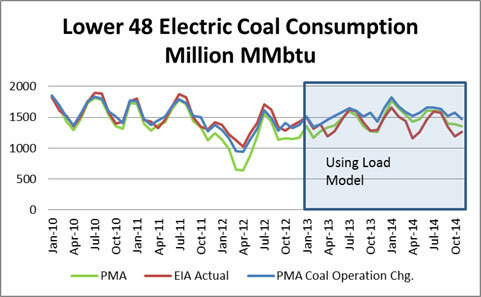 Coal generators felt the squeeze, particularly, if you had to purchase spot coal. The price of spot coal was very high and would be typically $10+/ton more than contract coal. During the height of the export markets, there were possibilities of not being to obtain coal at any price. Therefore, there was much incentive to lock in most, if not all, of your expected coal purchase ahead of time, even if it was for just a year. Also contributing was the deregulation aspects of the power market. Before, a utility could plan and make a decision to produce power at fixed price given a fixed price contract for coal. The regulated utility had a mechanism to fully recover all their fuel cost. However, with deregulation and the developed option to obtain power from a market versus your planned generation, this caused a disconnect in the way things were done and how they can be done going forward. This new construct put several utilities in a position to not want to be bounded by too long of contracts either. Coal operators and coal generators need to come up with new ways to align themselves. I believe coal contracts need to be structured on spark/dark spreads allowing protection from low gas prices for the generators to ease inventory concerns and at the same time giving coal producers the upsides during peak time periods. If you are interested in this process, All Energy Consulting will be happy to demonstrate and work with both the coal generator and coal producer to structure a win-win situation. We are currently in our continuous improvement plan cycle for Power Modeling Analysis (PMA). This includes updating our loads and revisiting our calibrations and adding other regions into our suite of fully calibrated pricing hubs. 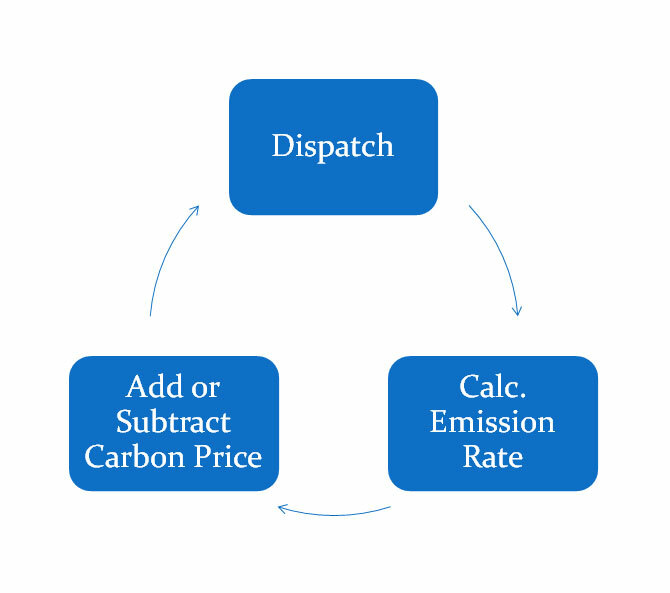 The process of calibrations requires the knowledge of understanding all the drivers of a dispatch model. With over 85 characteristics that drive unit operation and another 30+ combination of logic switches to change the dispatch algorithm requires years of experience to navigate and find the right recipe to produce the correct results. Building and maintaining models is not an easy task. Typically these task are regulated to an inexperienced analyst which can lead to frustrating results and multiple waste of time. Our Power Modeling Analysis (PMA) requires 100’s of hours to maintain and that is using a decade long full-ranged experience power analyst who, not only is experienced in the analytics and software side, but also experienced in the management and operation of utilities. There will be no model that is perfect – but we at All Energy Consulting have the pursuit of a perfect model. Waiting for the perfect model, you will be stuck in analysis paralysis which is as worse as having no model at all. Using inexperience analyst, you will lose the most important things in a model – the intimate awareness of the models limitations. I personally know all the limitations and issues with the PMA model. Many have asked the PMA model to do weekly projections – this is very possible, but this requires a different setup and data feed. The current data feed (monthly forward curves) limits the current setup. Plus the weekly requirements will need greater precision, such as outage feeds and more real-time load. All this is possible and we will pursue this, if our clients desire it. 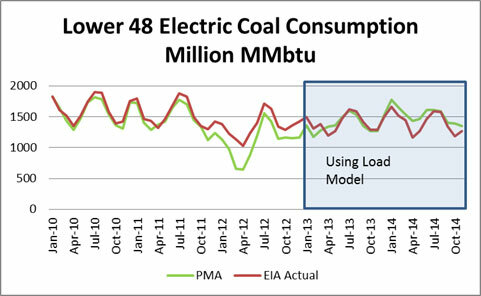 As I noted in my Power Modeling whitepaper there is a significant amount of work required to model the power markets. Can you afford to leave that work to inexperienced analyst? I know some companies have a staff of 10+ trying to manage a power model. With that many hands in the model, there will be many issues in just the maintenance of the model. Then, typically many of them are all working on other projects not related to the model. This causes a lot of the work of maintaining and managing a power model to an inexperienced analyst. I have observed the destruction of great initial work, crumbling to meaningless garbage of output. Besides running our own model and having the ability to customize it for each client, we can also help you maintain and operate your internal power models. It would not be cost effective to have a full-time, very experienced power analyst spending their effort on a model, given all the other task required to do in the company. Even if you could afford it, your typical employee probably does not enjoy that. They rather be fully engage in the results and leading the company in actionable decisions. A model, no matter a power model or refinery model, the value is ultimately the ability to decipher the results and apply meaning to them. The only way that occurs is if you intimately know the models limitations and continuously maintain it. The markets are changing and your model will never be perfect, so a continuous improvement plan is needed. PMA has a continuous improvement plan. All Energy Consulting can help you understand the power markets by offering our PMA platform or helping you with your internal modeling efforts. Stay tune our PMA results of Gas to Coal switching for 2015 summer will be released soon. Link to Full Article Fortnightly Magazine "Playing Safe with Capacity Markets"
Free PDF Copy of Fortnightly Magazine "EPA's Clean Power Plan: Unequal Burden"
Eagle Ford What Are You? Oil Price Drop Impacts Part 2 – The Bright Side! Summer 2015 Best Trade Update – Already?